I don’t really eat dessert. That’s not to say I don’t appreciate it, because I love me some chocolate. But it’s just not something I consume — or make — very often. My very good friend Annie was helping me brainstorm some ideas for blog posts and she suggested a fall-type dessert, a sort of teaser for the impending season. 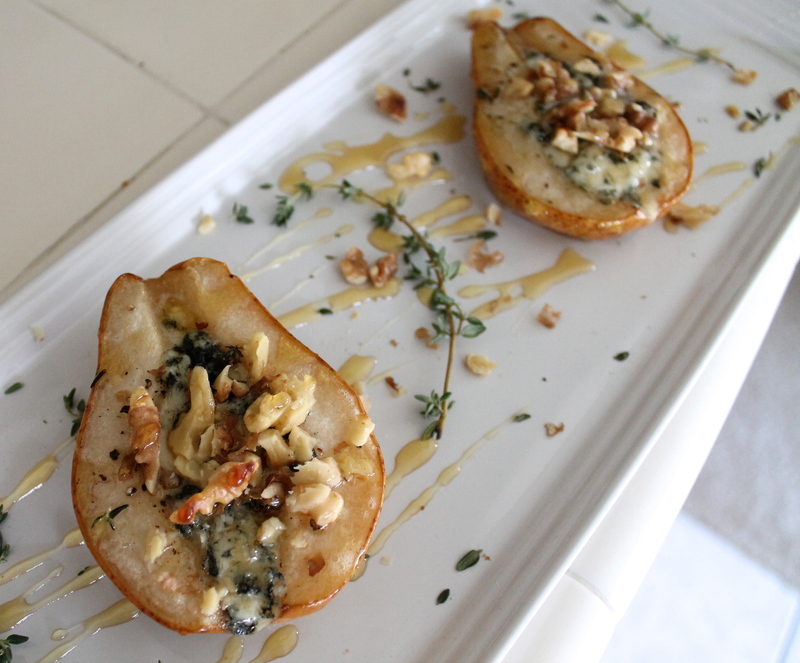 We came up with baked pears with blue cheese and honey, and walnuts for texture (and because I had some in my freezer patiently waiting to be used up). Delicious on their own. Dynamite when combined. This recipe is super simple and a crowd-pleaser, perfect for when you want to impress company. 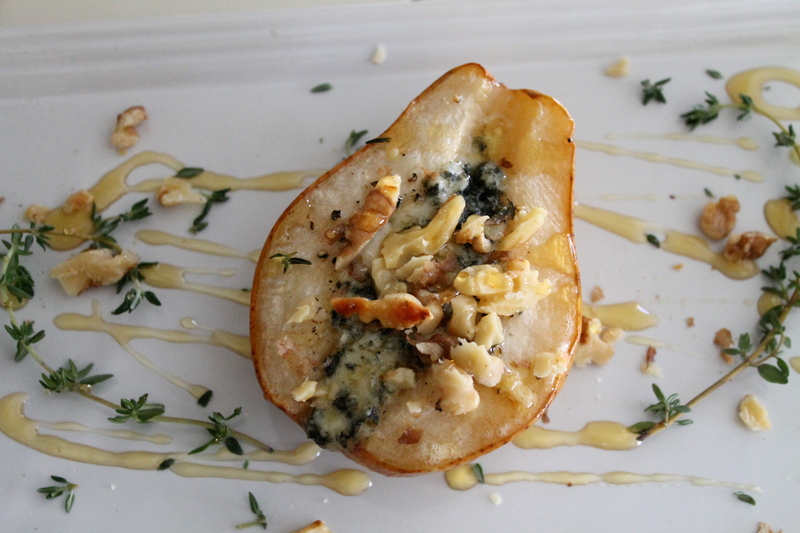 Pears are in season and you can choose a local honey to showcase on this dish. It’s a savory dessert with enough sweetness to leave that tooth of yours satisfied. 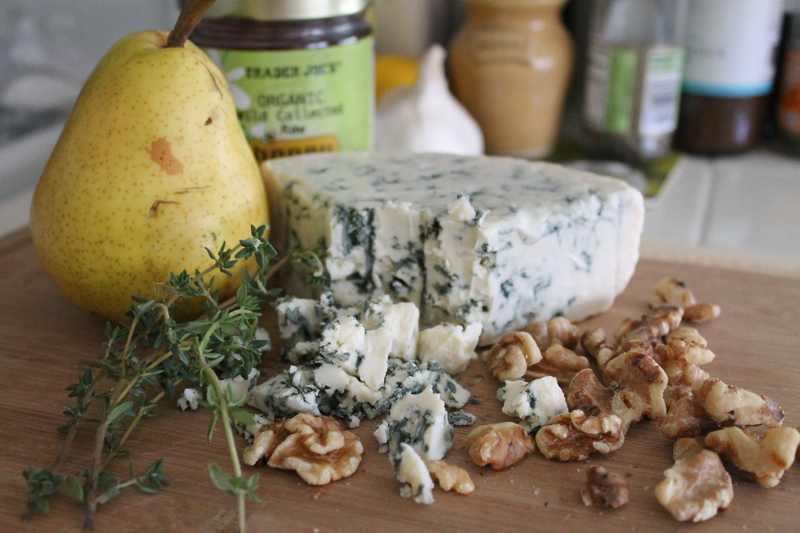 And let’s be honest, you can never go wrong with blue cheese. Even for dessert. 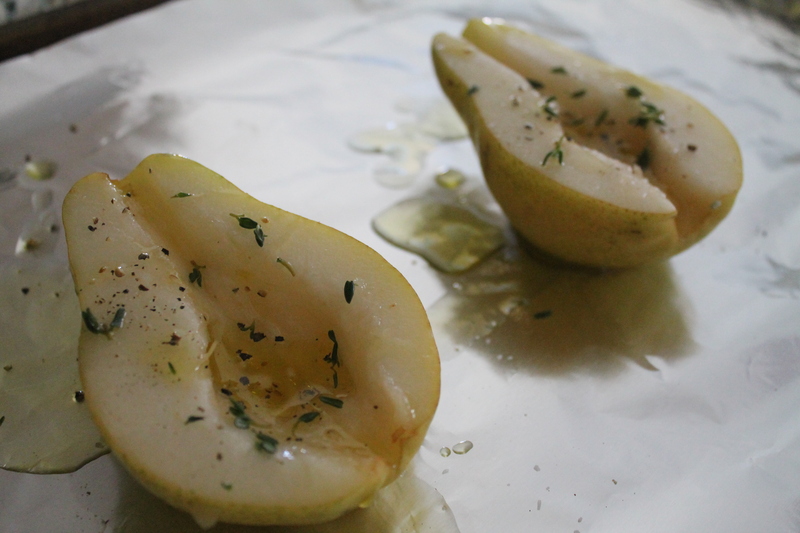 On a lined baking sheet, lay the pear halves cut-side up. Drizzle with EVOO and sprinkle lightly with salt and pepper. If using thyme, sprinkle the leaves on. Bake the pears for about 20 minutes. 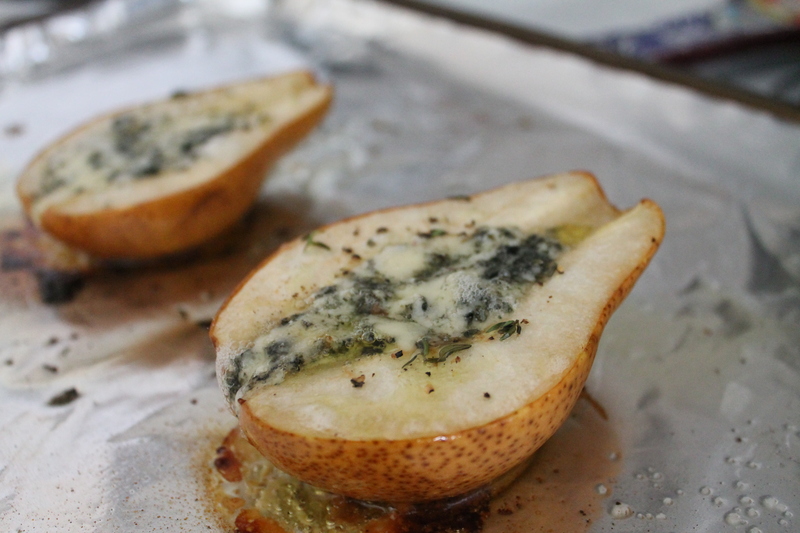 Take the pears out of the oven and fill each half with blue cheese. Return to the oven for another 10 minutes. Remove the pears from the oven and let sit for about 3 minutes. 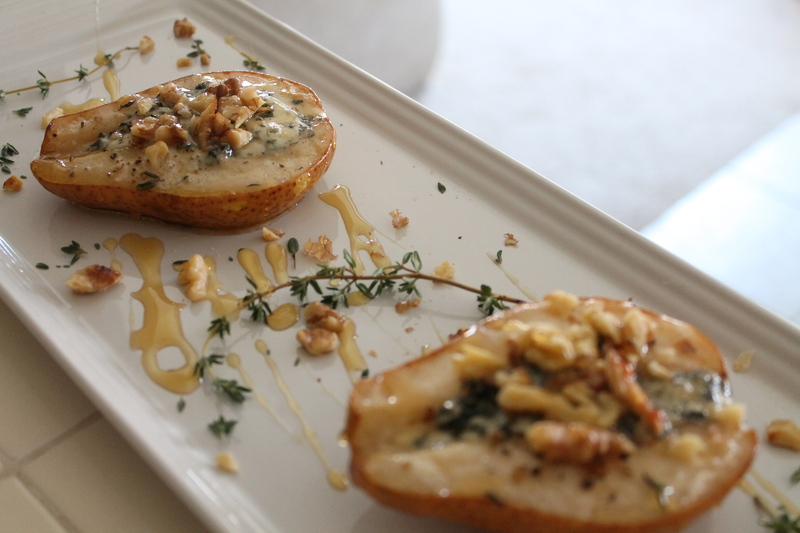 Add chopped walnuts on top and drizzle with honey. Serve one half to each guest. Take a bite and realize how deliciously savory dessert can be. Toast the walnuts beforehand in the oven for about 5 minutes, or on a stove top in a dry pan over medium heat for about 5 minutes. Sprinkle the pear with cinnamon or cardamom instead of salt and pepper before putting it in the oven for more of a sweet flavor. Use pears that are ripe, but firm. Skip the honey and make this an appetizer by serving it on top of arugula with a balsamic dressing. What’s your favorite fall flavor? Tell me in the comments! For the record, never liked pears. But this combo is the good good. Did I say that right? Not up on my hip speak, but I like snoop lion. My name will be snoop court soon. Anyhoo, awesome dish but I have to ask – why was I not given the options above whilst this baked in my home?? Cranberries? Cinnamon? It’s like you don’t really like your friends evil foodie web temptress!! Looks delicious – what a great combo! Thanks! They’re so easy, yet decadent.